For more than a century, girls of a certain age have been mysteriously vanishing, never to be seen again. Some say they were taken by the Crooked Man, who always travels with a strange little black cat at his side. Now he’s kidnapped your very own sister! You’ve got to unravel the riddles in the Cursery and find out who's the mastermind behind this whole evil plot. 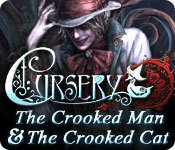 Cursery: The Crooked Man and the Crooked Cat is rated 4.4 out of 5 by 57. Rated 5 out of 5 by MooGuru from Delightfully ... crooked! Dark and intricate storyline, absolutely gorgeous music and visuals, an absolute gem of a game! I played the SE. Game play is well paced, with items required turning up when you need them so your inventory doesn't get bogged down with "well, I still don't need YOU" items. Fewer HOG's than usual with this developer but a lot of quirky games which were fun to play. The games are introduced with a riddle, but there is a tab on the side to gain better instructions if the object of the game isn't obvious. Highly replayable, mainly due to the level of detail in the artwork and the beautiful (and purposeful) music score. A must have game for lovers of olde worlde nursery rhyme characters too! Rated 5 out of 5 by DragonLiz from I do hope there's more of them Blue Tea games have another winner with this challenging, interesting puzzle game. As you play you discover more about the mystery and the characters. Answers lead to more questions right to the very end. I hope Blue Tea makes more Cursery games. I would like to learn more about the Mother Goose. I think the Cursery could be as good as the Dark Parables, another series of theirs that I quite enjoy. Rated 5 out of 5 by JulzCat from The Best of the Dark Parable Series! I was really surprised by this game. I knew it was a spin-off of the Dark Parables line, but I wasn't expecting it to be even better! The hauntingly beautiful music and graphics, the tragic story line and the cute little pop-up map all combined to make this an EXCELLENT game! Rated 5 out of 5 by andibeard from Deceptively Complicated Many of this game's best features have already been described, but I'll add my voice to those who love the visuals, the dark concept, and the nursery-rhyme themes. 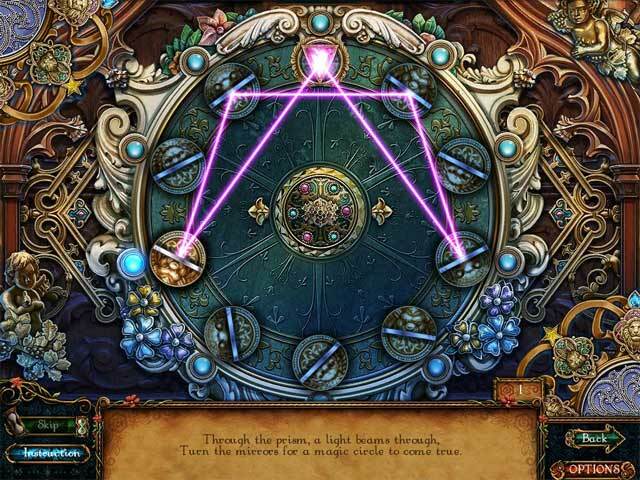 But what I really love is the level of difficulty, which required me to go beyond the usual "do the obvious thing" mode of many HOPA games. The mini-games are challenging but not impossible, and the HOS are also more difficult than average for the object-assembly type. I found that the navigation at first was confusing, so the map really is necessary, particularly toward the end of the game (when you have to return to unsolved puzzles from the very beginning). But surprisingly, the storyline actually ties things together pretty well, and turns out to be less cliched than most. A few warnings, if you're expecting the usual treatment: First off, I said the map is necessary, but there are also times when it doesn't work (due to the Crooked Man's powers), so you shouldn't depend too much on it for navigating locally. There's also at least one instance of something you need to write down, since this game doesn't include a journal. But I enjoyed the challenge of a game where things were not necessarily easy or obvious, but still in the end made sense. I hope they will make more Cursery games like this one! Rated 5 out of 5 by mouser9169 from As dark as the "original" mother goose and grimm This review is based on a complete playthrough of the game. Very solid game from Blue Tea. It's a dark fairy tale, like most fairy tales originally were. Don't expect a disney-fied 'happily ever after' at the end. Loads of puzzles and a few FROG's. HO scenes repeat, and so do some puzzle themes. 3 difficulty's, separate option to turn off sparklies, misclick penalty in FROG's, and two sets of instruction for puzzles: a riddle, and then you can click for more prosaic instructions if you don't 'get' it. THE GOOD: The story is excellent. Pacing is spot on. Information is revealed to you as the game goes, and there's more than one 'twist' along this crooked path. Took me about five and a half hours, working out almost all the puzzles and finding the items in the FROG's. Graphics are solid, with some really good voice casting. There were a few 'jarring' moments when they threw things in that didn't fit the theme they laid out that keep it from the perfect five (a pair of bolt cutters straight out of your local hardware store in the first scene being one example). Puzzles are challenging, and the 'riddle' instructions are a nice change of pace. If you don't get the riddle, normal instructions are just a click away. There was only one puzzle I had to skip. If you've played any of the Dark Parables, you know what the HO scenes are like (there's even an easter egg to one of the DP games). Same system used here. Find item pieces that match the pictures, and they all get put together to make one item for your inventory. They do a good job hiding them, but the hint is there to help you. THE BAD: Widescreen option distorts the image rather than giving a true widescreen picture. That's about the only technical fault I can come up with. THE UGLY: There were a few times I got knocked out of the flow of the game, either by artwork not matching the style and palette of the surroundings, or else the story not following the games own logic (someone asks for a weapon, there's a sword right there on the wall. Why can't I hand them the sword?) These are minor and far between though. BOTTOM LINE: Loved this game. If you like darker stories, and have the patience to work through some challenging puzzles, give this game a go. Rated 5 out of 5 by SparkleGlow100 from Greatness in art and story-telling… Oh my gosh! What an absolutely absorbing game. Very beautiful, gorgeous graphics and so many scenes. 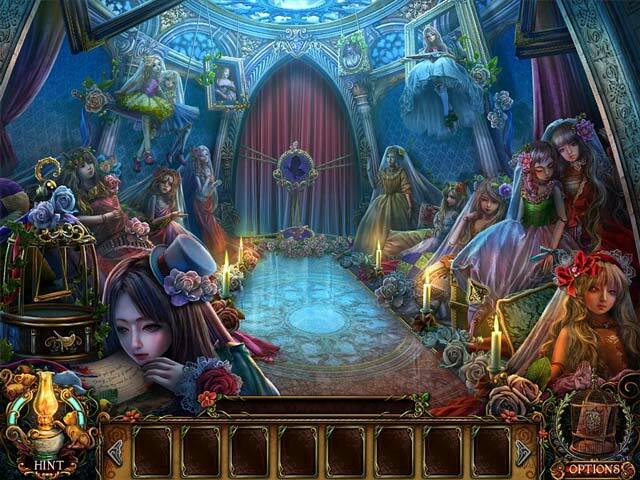 The story carries a constant thrill of mystery in this fairy-tale, intriguing story, by BLUE TEA GAMES. Flowers and forests, cliffs and flowers, flowers, flowers, huts and mansions, Alice in Wonderland type weirdness and underwater magic. FROG HOGS and lots of puzzles.Ornate and beautiful HOGS just like only Blue Tea Games can do. I can see now why some of the reviewers for Dark Parables: The Queen of Sands were a bit disappointed with that particular game, because this game by Blue Tea Games is so much more superior. I’d forgotten just how GOOD the quality of these earlier games were. The description of kidnapping originally put me off and I didn’t even trial this game, but “pennmom36” had written that this was a result of a nobleman seeking his lost love, and so that put a different spin on it. Wow, how sad that Blue Tea Games no longer make games of this magnificent quality. It was some time ago that I played Dark Parables: The Exiled Prince, DP: Briar Rose, and DP: The Last Cinderella, so I couldn’t quite remember the awesome quality that has now been lost through collaboration with Eipix. Even though I LOVED DP: Queen of Sands, this game here, The Crooked Man and The Crooked Cat is in a totally different league…a league above. Rated 5 out of 5 by p2668 from Good to the Last Drop!! Really loved the puzzles, and there were more than enough, with some easy and some challenging. Some games I have played get really tedious near the end, but this one just kept getting better and better as it went on. The graphics were gorgeous, and the underwater scenes were awesome! I normally don't care about the story, but this one was really interesting in a weird sort of way, and the music was outstanding. A lot of beautiful details went into the scenes and the bas reliefs, and items needed to complete tasks. Really really enjoyed playing this game, and would like to see another cursery sequel. Rated 5 out of 5 by deeanddeeann from AWESOME!!! STRANGE, WEIRD AND SO MUCH FUN!!!! it's totally awesome, it's warped and it's weird and is totally fun. i couln't stop playing it. if you want to have a really fun experience, play this game!!! Rated 5 out of 5 by taylormary930 from One of my favorites! 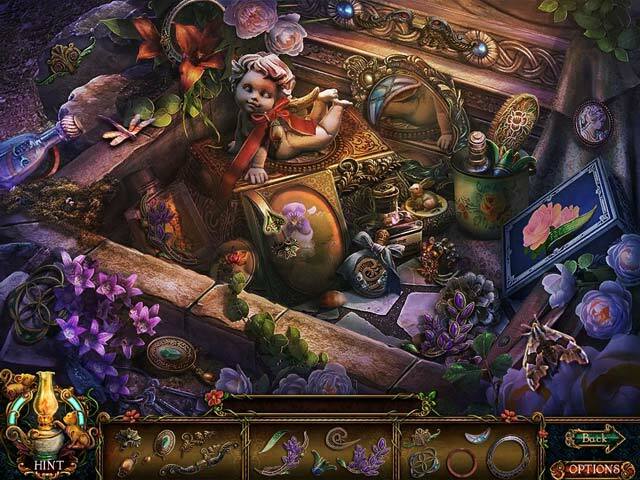 This is one of the best hidden object games that I have ever played! The graphics were outstanding and the storyline was gripping! Please, please continue the Cursery series!